After the part was milled, it was de-burred by sanding it gently with 320 grit sand paper. Once the desired surface smoothness had been achieved, gesso is applied to the mold to seal the open cells the mill exposed during processing. 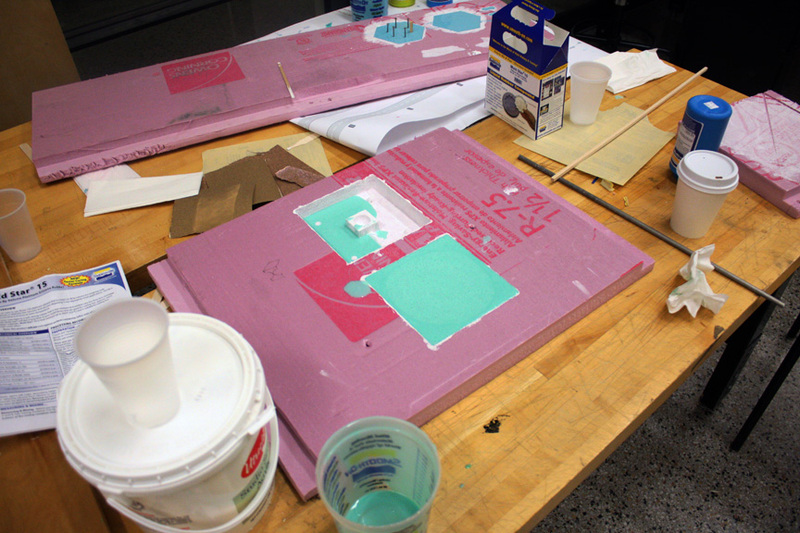 After the gesso completely dried, I was ready to pour the mold casting compound. First, cover the mold with a releasing agent (ordinary hand soap). The mold making compound I used for this was Smooth-On Oomoo 25. This process was very straight forward as the mixing ratio is 1:1. FOLLOW THE MANUFACTURES INSTRUCTIONS CAREFULLY. As seen in the above image, only one half of my mold was cast. This is because just this one side consumed all my Oomoo :( and there was no more left. So plan B, Utrecht. 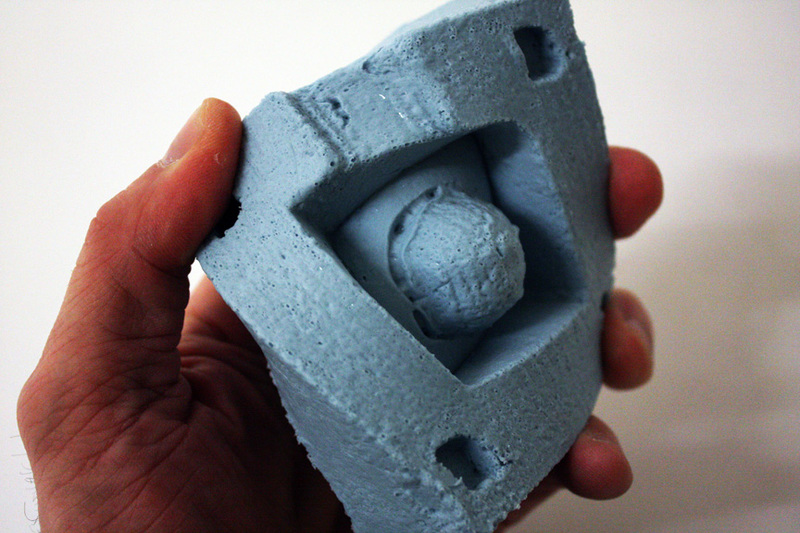 By using the same steps and techniques outlined in the “mold casting 01” section, this mold cast was successful. 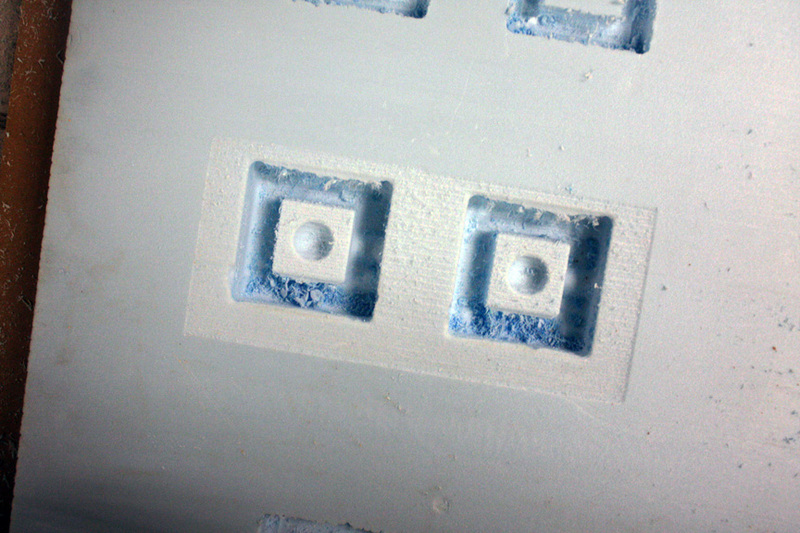 Notice the differentiation of color seen on the top of the finished mold. This happened because of an inconsistency in the part of the compound NOT labeled to shake first. So the moral of the story is…when in doubt, shake it. 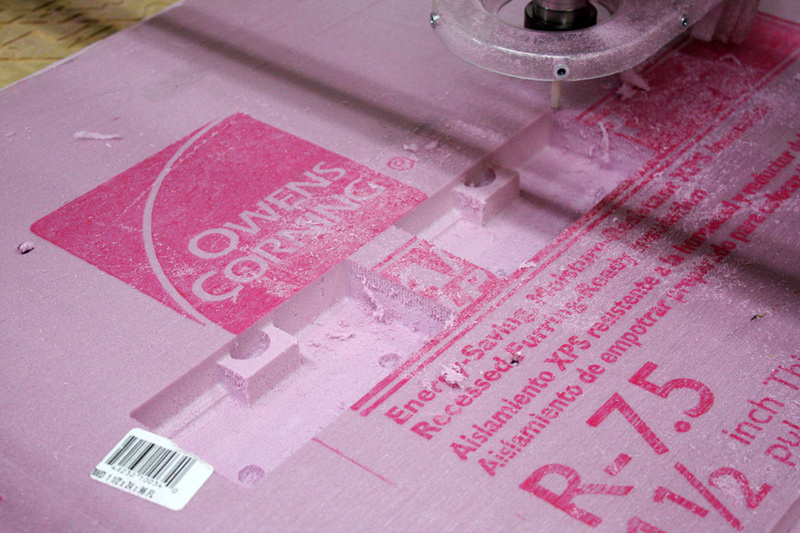 When milling the mold, avoid 90 degree inward corner conditions. I found that the molding compound splits at these connections as seen below. Casting parts is very similar to casting the mold. First, you apply a mold release agent onto the mold. Make sure to spread the agent onto the outer walls of the mold as this is where the two part mold will be compressing together. The releasing agent, when compressed, will form a seal. Next, mix the casting material as per the manufacturers instructions and pour slowly, allowing air to properly flow out of the mold as the casting material flows in. After the material sets up, the part should easily peel away from the mold. By carefully increasing or decreasing the amount of compound mixed, and applying different amounts of pressure to the clamp, the parts began to become consistent. a. When measuring the components of these compounds to achieve a 1:1 ratio, make sure you are on the most level surface as possible. b. 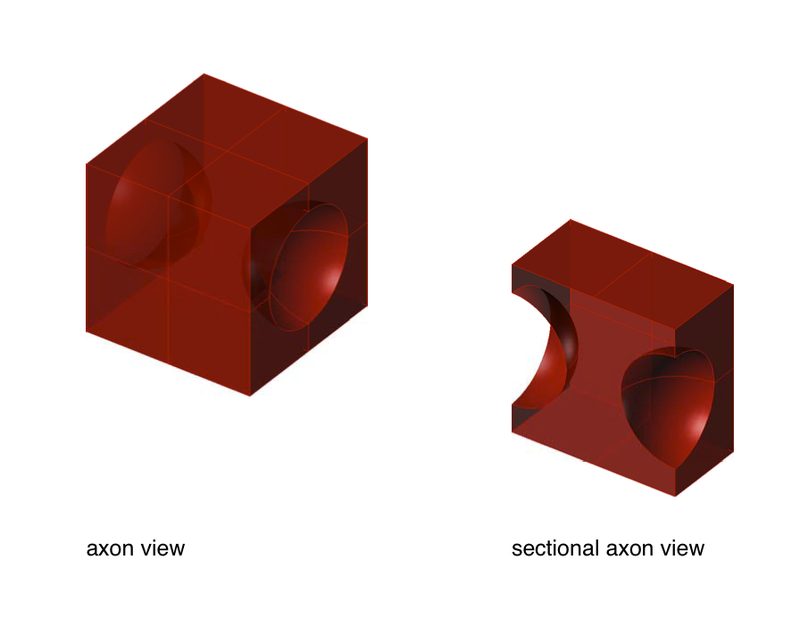 Shake all parts A & B even if it is not formally specified. c. When mixing both parts together to form compound, mix thoroughly to insure a good chemical reaction.